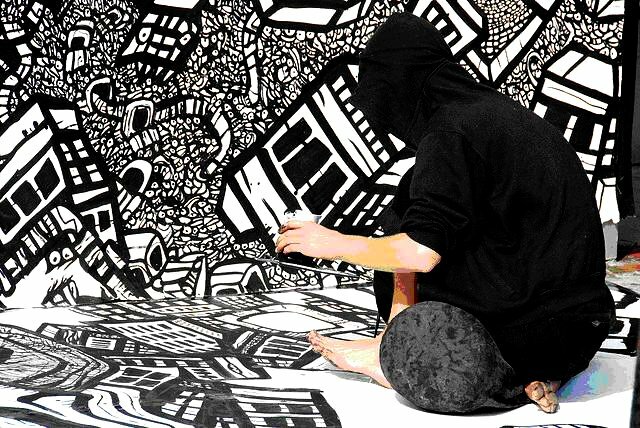 GRAFFITI DRAWING! The City is a Giant Gear but it’s up to all the strange characters to make it spin! Laughing buildings turn into monstrous creatures while tiny citizens dance around unconscious routines. An apartment becomes a skeleton, electric wires turn into trees and a twenty story office tower grows the great gills of a giant fish! Yet despite the chaotic and primal metamorphoses the city never ceases to thrive. New people and ideas perpetually appear out of the thick grey mist blankets which cover the billboard horizon. Armed with crates small artworks and a giant piece of blank paper I continued to hit the streets to do live paintings throughout 2008-09. Although I ran into some troubles with Toronto’s weather I till managed to find new venues, new faces and new inspirations. 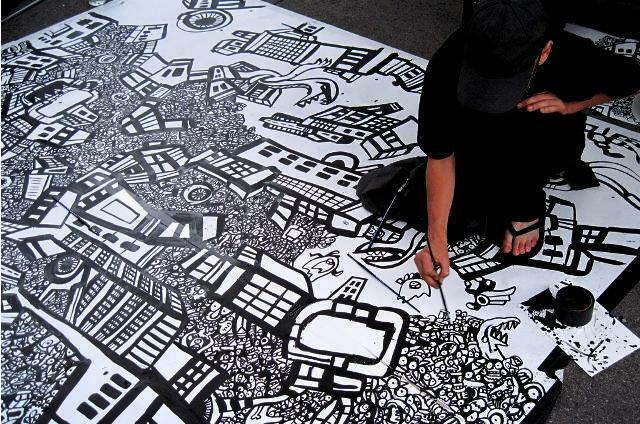 2008 was both a frustrating and exciting year for me as a street artist. The down side of the adventure was the weather (which I used to refer to as my “Boss”)as Toronto suffered an unusually inclimate summer. 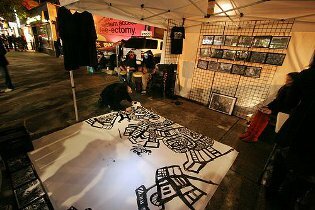 In the previous years it had been my practice to work on smaller pieces and spend time talking with people during the week while saving the live graffiti drawing performances for Saturdays and Sundays. 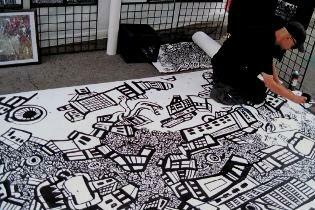 In 2007 I had completed 27 live mural paintings by the end of the season but in ’08 it rained almost everyday and was especially wet on the weekends. 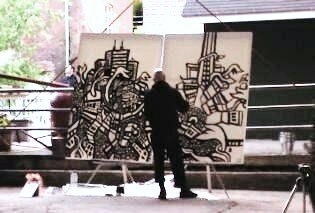 As a result I couldn’t set up on Queen Street very often and when I did I spent most of the time working on smaller drawings. The clouds were always threatening and I never really knew when I would have to pack up and run. 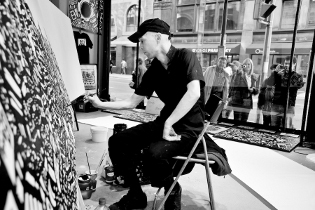 Due to the constant rainfall I only managed a couple of outdoor performances but on the brighter side of things I was lucky enough to find opportunities to paint at festivals, prestigious events and in other cities. Although the rain prevented my outdoor work in Toronto, it didn’t stop me from having a great year and painting on a regular basis. 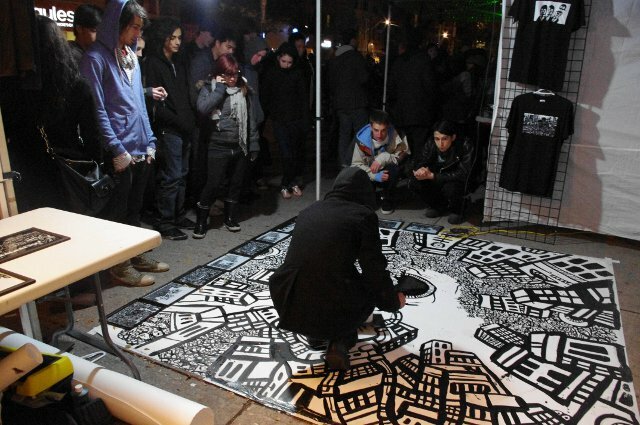 I was invited to do live graffiti drawing performances at several gala events including shows at the Don Valley Brickworks, the Toronto Outdoor Art Exhibition,the Scotiabank Nuit Blanche and in galleries on Queen Street West. 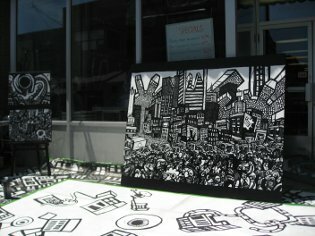 The highlight of the year was a 3 day demonstration in the storefront window of the Hudson’s Bay Company. 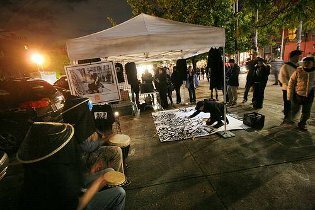 This performance offered the perfect combination of street exposure with the comfort of a studio and the prestige of a major exhibition. 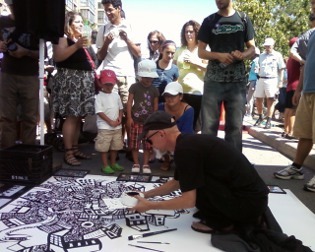 As I discovered alternative venues to the sidewalks of downtown Toronto I was able to bring my graffiti drawing performances to new audiences and locations. Inspired by the experiences of this transitional period I decided to retired my regular Queen Street and Kensington Market interventions in the fall of 2008. As much as I enjoyed working in public it was time to take a different appraoch. I have since continued my urban experiments by travelling with the performance.